The “Who Shot Mr. Burns?” two-parter is a major milestone for The Simpsons. The contest surrounding the whodunit provided fans with an unprecedented opportunity to interact with the show, in both the search for clues and the prize offered to armchair gumshoes: The chance to have their likeness mingle with the denizens of Springfield in a future episode. The hunt to finger Mr. Burn’s assailant even extended to the unchartered realm of the Internet, with the establishment of an official web site devoted to the mystery. Throughout the summer of 1995, the episode’s titular phrase—a riff on a question that perplexed audiences 15 years prior—stayed on the lips of the American viewing public. It was a new level and new kind of cultural penetration for The Simpsons—one it would never again reach. If it wasn’t clear when syndicated reruns of the show began airing in the fall of 1994, the thousands pointing their cranky dial-up modems toward springfield.com confirmed it: The Simpsons was no longer the brash upstart it once was. By ending its sixth season with “Who Shot Mr. Burns?”, the show mimicked one of the biggest TV phenomena of all time: Dallas’ “Who shot J.R.?” arc, which spanned the end of that show’s third season and the early goings of its fourth. More shockingly, “Who Shot Mr. Burns?” stirred up a conversation that was almost as loud as that inspired by Dallas’ “A House Divided.” The Simpsons was A Big Deal in the early ’90s, but with this cliffhanger, it created what only a bona fide TV institution can. “Who Shot Mr. Burns?” wasn’t just another episode of The Simpsons—it was an event. And it was created to be one, too. It’s still possible to enjoy the episode as a finely crafted half-hour of The Simpsons, but that enjoyment is tied tightly to the central mystery. 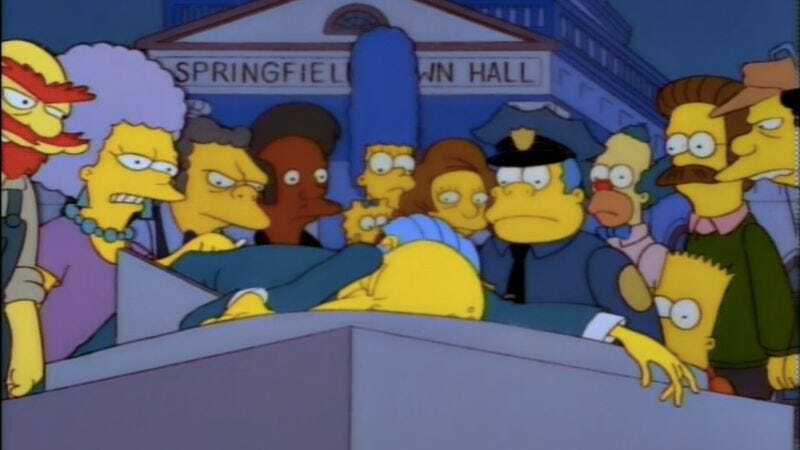 It’s much more than its climax, yet “Who Shot Mr. Burns, Part One” can’t be divorced from its final scene. C. Montgomery Burns’ stumble across Springfield Town Square is the conclusion to some narrative heavy lifting (with a side of Easter eggs), the truth of which, unsatisfying though it may be, is there for those who want to find it. The clues are sprinkled all around, and only a few call attention to themselves. For example: There’s a reason the TV at Moe’s pulls your attention from the conversation between the barkeep and barfly—and it’s not just because of the Mystery Science Theater 3000 wink. This leaves the first part of “Who Shot Mr. Burns?” racked with strange internal tensions. There’s all this work being done to make sure the mystery is soundly constructed, which leaves much of the episode in a rush to catch up with itself. The show adapts to the whodunit format without strain, establishing Mr. Burns’ latest campaign of villainy as its main storyline. His fellow Springfieldians don’t have their own plots so much as they have a series of motives, which makes the second half of the episode feel a bit crowded once the jokes start piling up. That may be part of throwing the viewer off the scent, but “Who Shot Mr. Burns, Part One” is much more recognizable as an installment of The Simpsons in its opening minutes, which manage to shoehorn in a miniature critique on school spending before the mystery. Though there’s some obvious foreshadowing in Principal Skinner opening “Who Shot Mr. Burns, Part One” by coming across a felled rodent. But the other characters’ main purpose in this episode is to serve as suspects. In the context of “Who Shot Mr. Burns?”, a rich supporting cast rewards the show with a town full of potential murderers. It builds to a prohibitively frantic pitch, but the big fun of part one is in presenting the vast spectrum of reason’s Burns’ assailant has for pulling the trigger. While doing their homework, the writers got to amuse themselves with the conventions of the genre as well, dropping fake-outs like Superdude and giving Homer the pettiest (yet affecting) of motives: He’s a nonentity to Mr. Burns, not even worth mentioning in a thank you card. Everyone hates Burns to begin with, so the episode delights in finding ways to push the characters over the edge. The sun-blocking ploy winds up somewhere in Lex Luthor territory, but it does the job of implicating everyone in Springfield in the shooting. Eighteen years later, we can look at “Who Shot Mr. 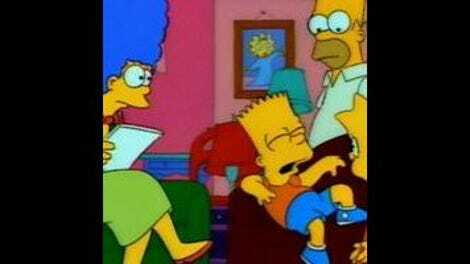 Burns?, Part One” as a successful experiment in The Simpsons thinking big without losing its core charms. The cliffhanger is irrelevant at this point—the central question now is “Can the resolution pay off this madcap whodunit?” I don’t think so: Like a lot of television mysteries that became zeitgeist-capturing catchphrases—like the one that inspired this first part, or the one that partially inspires the second, “Who killed Laura Palmer?”—the thrill is in the question mark, not the period. But “Who Shot Mr. Burns?, Part One” is such an inspired romp that I can’t find a reason to fault the show for not being able to follow through on it 100 percent. Can you?